Pre-heat grill to medium-high heat. Line grill basket with aluminum foil. On large cutting board trim the tops and bottoms of each parsnip, then peel. Slice in half to separate the top and bottom parts, then halve the bottom portion and quarter the top portion (slicing lengthwise) until all pieces are roughly the same size. Mine had a lot of variation to them, so don’t sweat this too much! 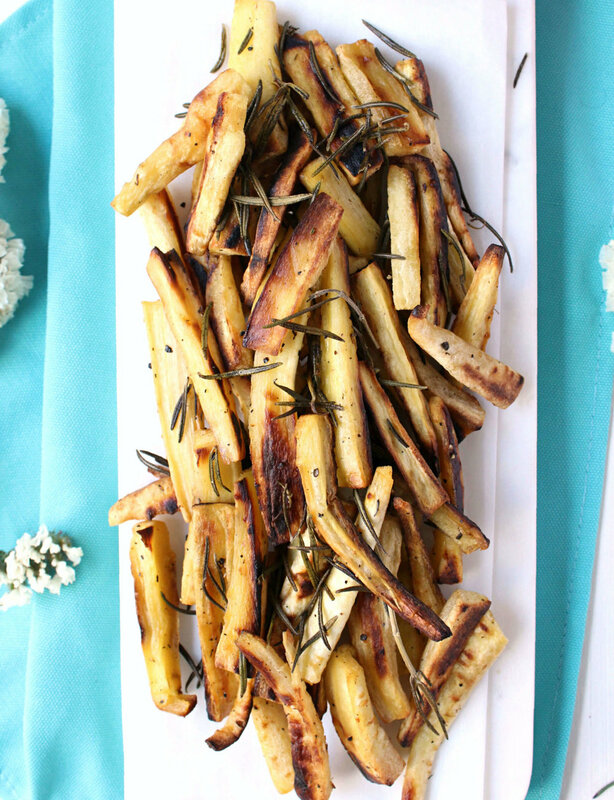 In large mixing bowl combine the sliced parsnips with EVOO, rosemary, and a few pinches salt & pepper, tossing evenly to coat. Transfer to lined grill basket, then grill for 35 – 45 minutes until crispy*, turning periodically to grill evenly. Meanwhile, in small mixing dish combine all aioli ingredients, stirring well. Chill in refrigerator until needed. When ready, serve parsnip fries with garlic aioli, garnishing the aioli with fresh chives if desired. Optional: Deseed the pomegranate. This video shows how to do it. Add the pomegranate seeds and the cooled roasted parsnip to your salad and toss. In large stock pot, heat olive oil over medium heat. Sauté onions, carrots and garlic until onions become translucent. Add potatoes, bouillon, and salt. Sauté vegetables until softened, adding beer to pot in batches to keep soup from sticking. Stir in kale and sauté for 3 minutes until it begins to softened. Add water to stock pot and bring soup to a boil over high heat. Serve hot with crusty baguette. Preheat the oven to 350ºF. Lightly grease a 2 to 3 quart baking dish with olive oil spray and set aside. Add the olive oil to a large skillet set over medium heat. When hot, add in the onion and cook until tender and starting to brown, about 5 minutes. Stir in the garlic and cook until fragrant, about 30 seconds. Add in the kale and vegetable broth. Cook, stirring occasionally, for about 6 to 8 minutes, until the kale has wilted down and the broth has evaporated. Remove from the heat. Add the vegetable mixture to a large bowl, along with the quinoa, lemon zest, cannellini beans, Greek yogurt and 1 cup of the cheddar. Mix until well combined. Season with salt and red pepper flakes to taste. Transfer the mixture to the prepared baking dish. Sprinkle the top with the remaining 1 cup of cheddar cheese and the walnuts. Bake for about 10 to 13 minutes, until heated through and the cheese is melted. Optional: Add the bacon to a large sauté pan over medium heat. Cook until the bacon is golden brown and crispy, about 4 minutes per side. Remove the bacon -- but not the bacon grease -- from the pan, and set it aside to drain on the towel-lined plate. Use a food processor fitted with the grater attachment -- or a hand held grater -- to grate the potato and onion. (The former is much easier!) Then use your hands to squeeze as much liquid as possible out of the potatoes and onion. Potatoes have a very high water content, so you'll be surprised at the quantity of liquid; you can actually "wring out" the potatoes! Doing this will result in much crispier potatoes. Place four (4 X 2-inch, round) ramekins on a baking sheet. Crumble the bacon and line the bottom of each ramekin with it (about 1 strip of crumbled bacon each).